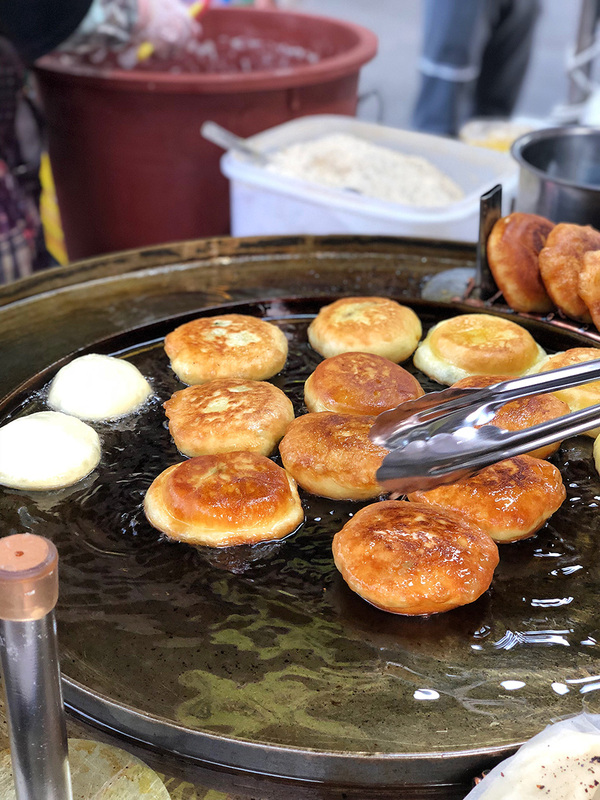 Hotteok is a delicious traditional Korean street food which is an absolute must to try on your visit to Seoul. It’s very hot(teok), and it translates to the ‘burned tongue.’ No, I made that up, but it easily can mean that because it’s definitely famous for it. 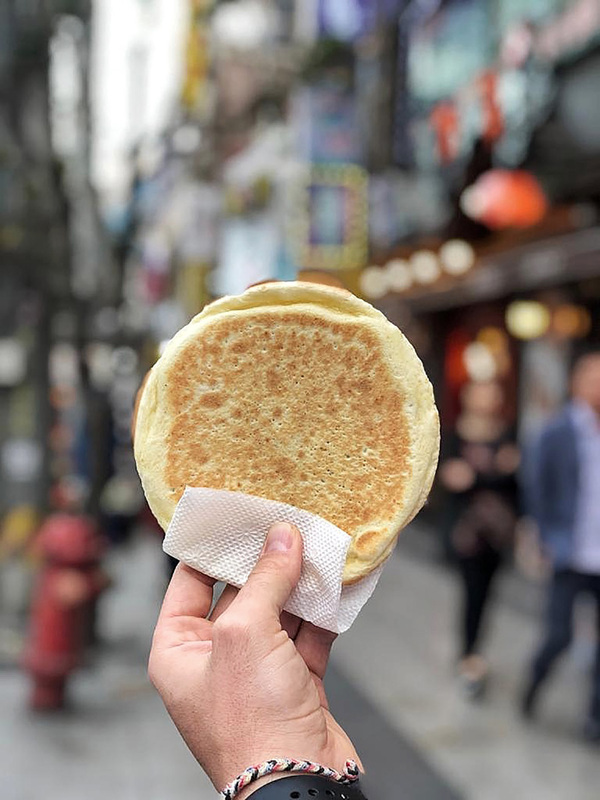 Hotteok is basically a Korean sweet pancake. It's usually made from the combination of regular flour and rice flour and is typically stuffed with the mixture of white and brown sugar, cinnamon powder and some grounded nuts and seeds. Then it’s fried or baked which caramelizes the sugar inside and turn it into the delicious melting lava which, over the years, claimed many victims of the burned mount. Seriously, be careful. Traditionally it has only the sweet filling, but it is widespread these days to find the savory as well. You can buy Hotteok for around 1000-2000 WON a piece around the Seoul. 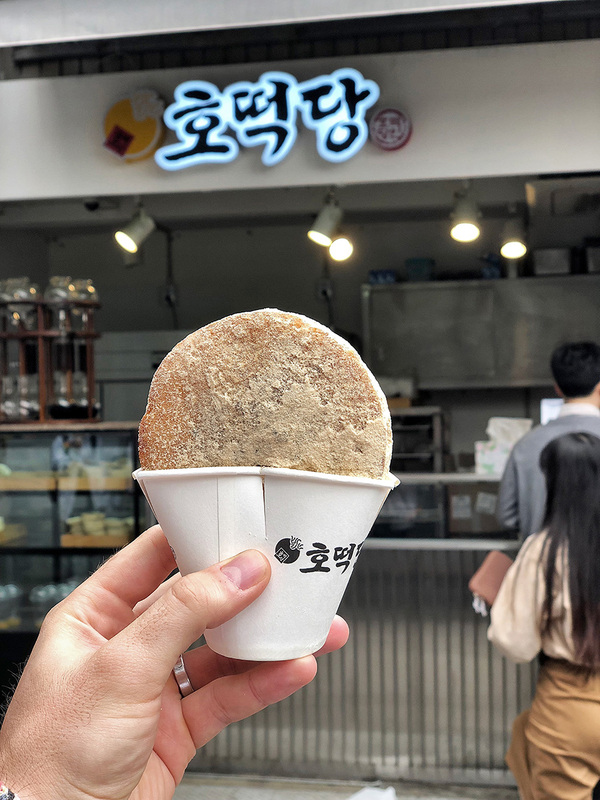 As with everything in South Korea, there is not only one type of hotteok, but every shop has their own distinctive style and flavor. I tried four different types, some very traditional and some with a little bit of contemporary twist. I don’t want to spoil it for you, but the Injeolmi Honey Hotteok definitely stood out. The Hotteok Dang shop I visited is in the new up and coming hipster area of Iksang-dong. 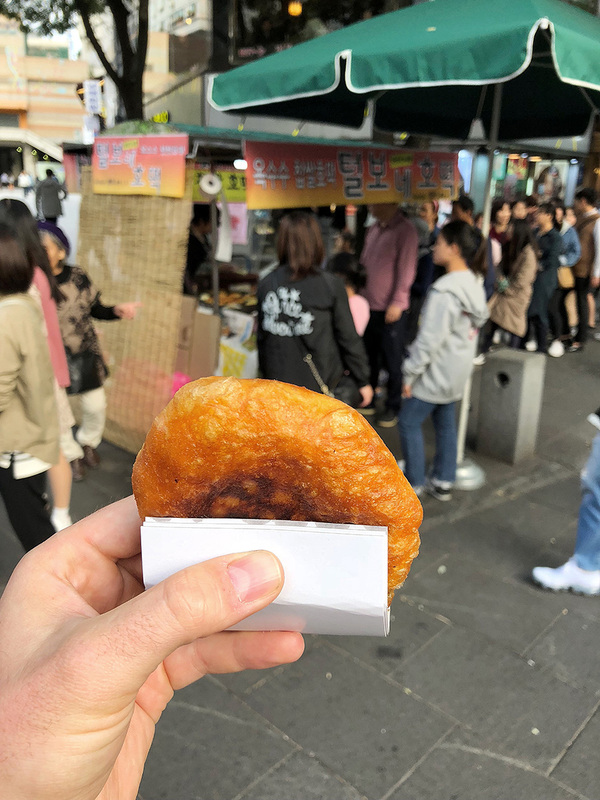 It made it even more remarkable because it was exciting to explore this fantastic area with a nice Injeolmi hotteok in my hand. Famous stall in Insa-dong where the ‘hotteok lady’ sell her cornflour hotteok since…forever. I never saw anyone as busy as her, and I totally understood why. The hotteok was fantastic, and the consistency of the dough reminded us doughnuts. Should I open the hotteok ‘doughnut’ stall in London? Maybe. The lady offered me a job, so she obviously could see potential in me. A little bit outside of the main Insa-dong tourist street is where the real Korean street food happens. This small local stall doesn’t look like much on the outside but don't get fooled, their baked hotteok was glorious. A little bit lighter version for us more health conscious. Yeah, right. Two, please. 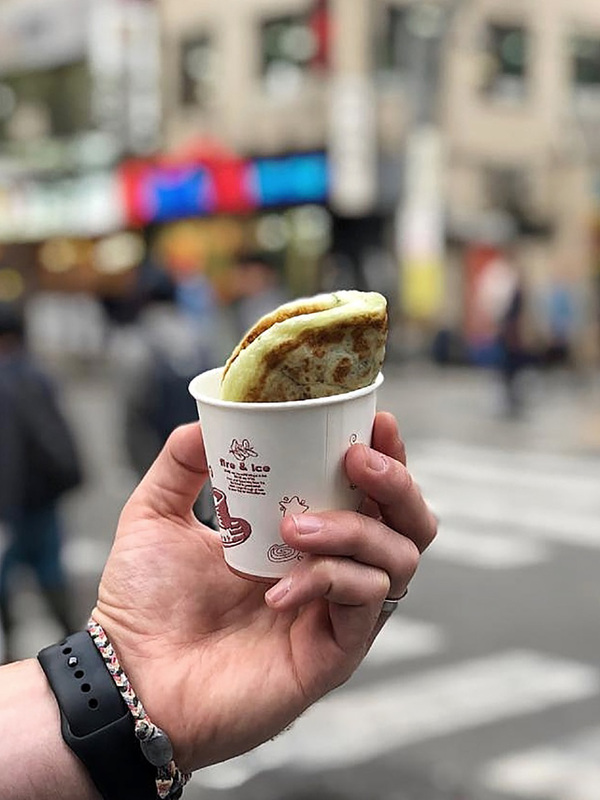 The most traditional version of hotteok you can find in the streets of Seoul. I found this stall entirely randomly, but as usual in life, random things are sometimes the best. Fresh, hot, sweet, chewy and for only 1000 WON. I love you Seoul. Which Hotteok is the best? 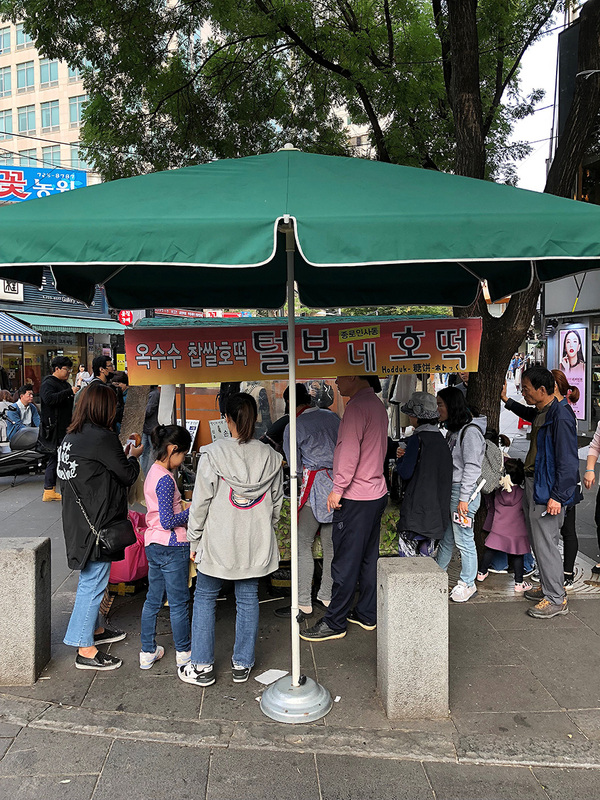 Area around the Insa-dong and Ikseon-dong are not the only places in Seoul you can get Hotteok. Because it is a very common Korean Street Food you can find it all around the Seoul in every market and on every street with food stalls. Visiting Insa-dong is usually a part of every tourist guide, so you will be probably heading that way at some point anyway. Food wise, Ikseon-dong is even more interesting because it is very hip amongst young local people. You will definitely find there many desserts which are trendy around Seoul at the moment.